This article in the most recent issue of the Economist seems to agree with the point I’ve been making for a while now, that stocks are fairly valued. The author starts by saying that the 1990’s tech bubble was, indeed, a bubble. I couldn’t agree more. Valuations went far beyond anything reasonable. The below graph shows how expected return (earnings / price) dropped to 3% in 2000 (2% if you use inverse of CAPE). This was when treasury yields were between 6% and 7%. A few more years of zero interest rates and negative bond yields, which force investors to seek higher returns from riskier assets like equities, and who knows what might happen. It seems strange to talk about low bond yields and higher stock prices without actually modelling out the past to see if stocks are reasonably priced. The graph above does this by showing that, far from heading into a bubble, stocks are simply following bond yields, and remain attractively valued. 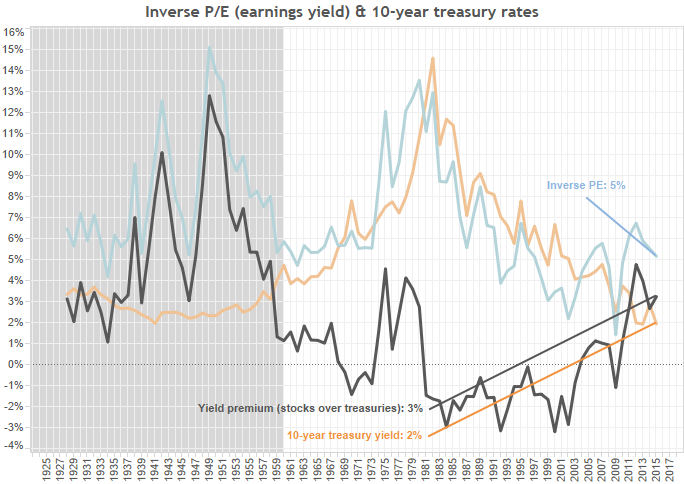 As bond yields increased in the 1970’s, earnings yield followed (meaning lower valuations). The reverse has happened since, as monetary policy has become ever tighter since the early 1980’s. Compared to 10-year treasuries, stocks are actually as cheap as they were in the 1970’s. There’s not a lot of room for bond yields to drop, but neither does overheating demand look likely to drive rates higher. Either aggregate demand will remain weak, rates low and stocks volatile (but clinging to higher valuations, lower yields). Or aggregate demand will pick up, forcing rates higher and stocks somewhat downwards. But hot aggregate demand will still likely mean a strong stock market for the time being. Returns won’t be spectacular, but the crash everyone seems so antsy to predict doesn’t look like it will happen anytime soon.